Whenever I make my mom's recipes, the aroma takes me back to my childhood. 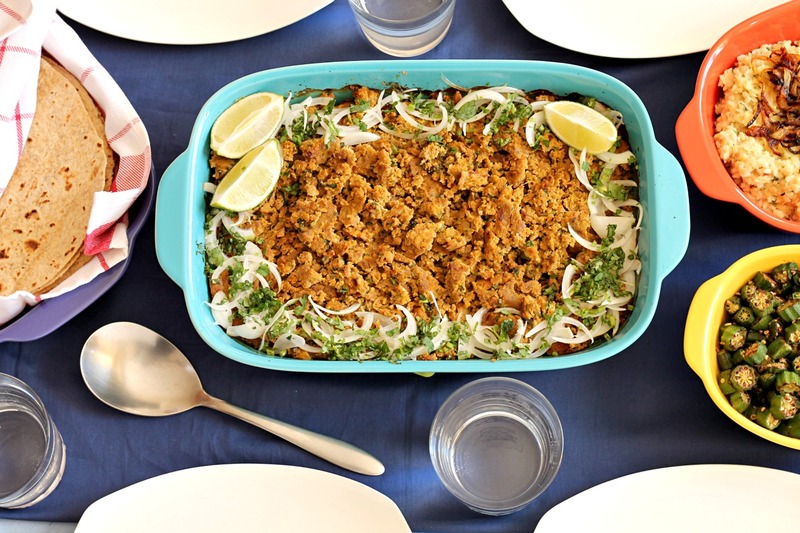 The recipe I'm sharing with you today is a dish my mom would make every Eid when we would all get together for lunch. It's a dish originating from Hyderabad, India. Growing up, I also remember this dish being served at many family gatherings and weddings. It's definite comfort food for me. My mom would typically serve it garnished with sliced onions, coriander and lime wedges. This dish is traditionally eaten with roti. Our typical side dish is Maash Ki Daal, pictured in the top right. I'm still working on getting the proportions right. Hope to get it perfected soon so I can share the recipe with you! When we use the term "dum" in Indian cooking we generally mean slow cooking with steam. I asked my mom why this dish was called "dum". When she was growing up they didn't have electric ovens like we do have today. So they would make a layer of coal and put the tray of meat on top and cover. Then more coal was put on top and they cooked it like this. To replicate this, my mom bakes the Kabob in the oven. Sometimes people give the aroma of charcoal by heating a piece of charcoal until it is red. Then place it on a piece of foil that is on top of the Kabob, pouring a bit of oil on top and then quickly covering. I have a ceramic cooktop so I have never done this step. To make this Kabob I used the 3 Quart Baker dish from CW by CorningWare. 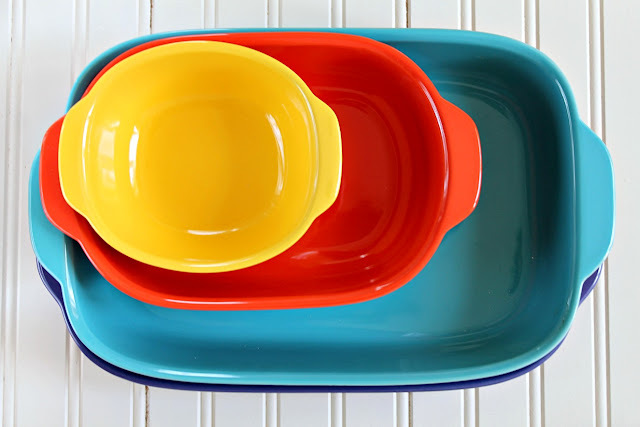 CorningWare has always been a staple in our home. My mom even had pots and pans made by CorningWare! 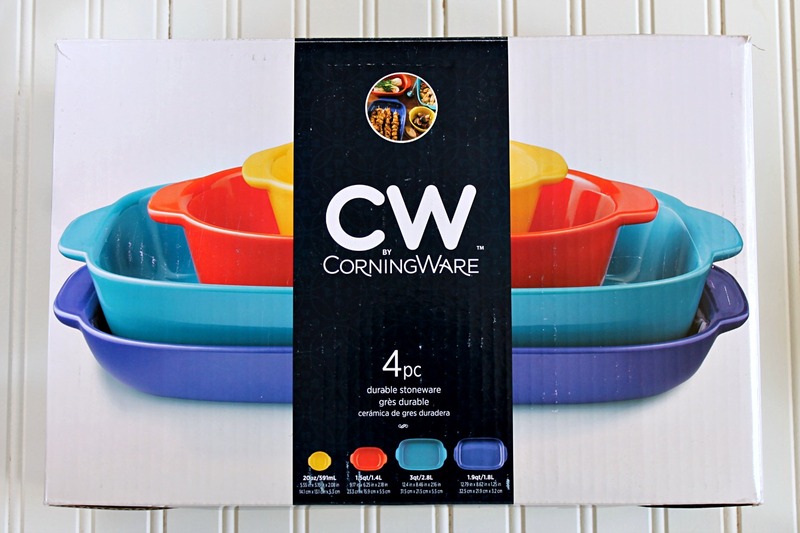 CW by CorningWare has the same quality that I've always loved but with a splash of colour. I loved working with these dishes. They are not heavy at all. You can win a 2.5 Quart Vermillion Baker from CW by CorningWare by using the Rafflecopter below to enter. This contest is open to Canadian residents only. * I usually have my butcher wash the meat before grinding so that I don't need to wash the meat. ** This is optional but adds a lot of flavour. I generally use whatever open Shaan Masala packet I have. I have used Tikka Boti in the past with good results. In a pot, heat oil over medium high heat. Add onion and fry until golden brown. While frying the onions, I usually prepare the almonds, poppy seeds, kabob chini, coconut and cardamom. In a large bowl, combine all the ingredients (including the fried onions) except the bread. Wet a slice a bread and then squeeze out all the water. Add to the bowl. Repeat with the remaining slice of bread. Mix the bread into the meat mixture. Marinate for a couple of hours, overnight preferably. Preheat oven to 400°F. Spray a 3 quart baking dish with cooking oil. Spread the meat mixture in the dish. Bake 30-40 minutes, or until meat is cooked. Break up the meat with a spatula. Garnish with sliced onions, chopped coriander and lime wedges. 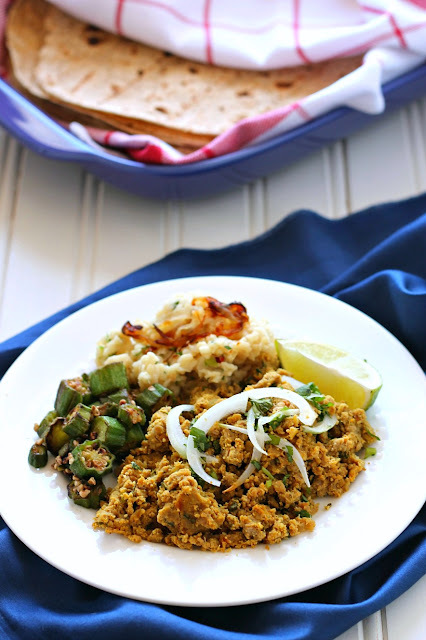 Serve hot with roti or naan. Disclosure: This post is sponsored by World Kitchen. I received compensation and free product. I'd bake a great pasta dish! I'd bake a lovely sweet potato casserole in this dish. The options are endless!! Probably mac n cheese before anything else though. Cabbage rolls or lasagna would be great. My family would love it if I made them a Chicken Pot Pie in this. I would bake a brunch dish! I would try a baked pasta. I would bake some basbousa in it. Thanks for the chance to win! I would make a pasta bake. I have a few pasta dishes that require this size of baker, so I would make those for sure. I love all the fun colours of these dishes!! I also would make a potato dish in it. Thanks for the chance! I would make baked cod. I would bake a yummie sheppards pie! I would bake lasagna in it. I'm hoping to make scalloped potatoes for Thanksgiving. If they turn out well, I'll make them! I would bake a bread pudding. I would bake a lasagna in this dish! I would bake creamy chicken & rice casserole in this lovely dish! I would make a tuna casserole in this! I would make a bread pudding. What would I make in this dish? Any and everything!!!! Lasagna, brownies...Hyderabadi Dum Ke Kabab!!! I would bake chicken Parmesan in this dish. Love Corningware! I have a French White set that I keep for company :) My mom has some of the old school corning dishes and it's so beautiful! Love the kababs! I've also seen my mother in-law do the whole charcoal+foil+butter/oil thing, but I too have never attempted it myself.